November | 2010 | Frank & Donnis Travel Blog "the more we see the more there is to see"
I woke at 5am. This is getting ridiculous waking at this hour or earlier, almost every day. I must admit that after yesterday’s long walk I was in bed by 9pm so all in all I got 8 hours sleep. By 9 am I called Navman on their 1300 number and of course was on hold for 11 minutes. However I did get their approval to have the unit replaced as it is faulty. They gave me an authorisation number which I used later in the morning to take to a Supercheap Auto store here in Noosa and after some concern that they could not find their stock they finally called me to say they found the missing stock and I was welcome to one as a replacement. Donnis has woken not feeling well so went back to bed while I went shopping. I got a corned beef for dinner and a couple of deluxe breadrolls for lunch and got my blood pressure prescription filled. This time next month I will need to see a doctor and get another 6 months prescription. This afternoon Ken asked if we would like to go to Cooroy with him as he wanted to pick up some timber. He dropped us in the middle of the Cooroy Shopping Centre. Was this little hamlet ever so busy and many of the shops are all old original buildings, colourfully painted and decorated and food outlets with tables and chairs spilling out into the street. Alas at 4pm all the eateries were closing down for the night. I walked past a Thai Restaurant and the smells were so lip licking good. Across the street the local RSL had $5 lunches and $12.90 evening meals and a $10 bottle of wine deal. Hmmm. When we are in Traveston this could be a place to visit. Laurie H has just left the area and she warned me there will be lots of eating out places I should try. I might have to sell something to enjoy the local foods. On the way back from Cooroy, Ken insisted he take us to Timbeerwah Mountain Lookout (265 metres above sea level – as far as mountains go it is a bit short but all the mountains along this part of the coast are the remains of volcanic plugs weathered over millennia) which is also the local abseiling place. Let me tell you the cliff faces are straight and scary. There was a strong wind blowing all day and by the time we climbed to the lookout the temperature had dropped by at least 4 degrees and rain was on it’s way. What a view out over the lakes the river and the ocean. Again I forgot my camera. Another early morning. Awake before 5am but managed to stay in bed, nod off to sleep and wake again shortly before 6. Donnis wanted to stay home and do a bunch of chores while I wanted to get out and about. The wind which has been blowing for the last couple of weeks was still blowing. Between periods of sunshine there were periods of rain showers. I drove over to the beachside suburb of Sunshine. (I wonder if anybody has named a town, suburb or other location, RAIN! or even OVERCAST!) the wind was blowing directly onshore and the waves were large and confused with sand being blown off the beach. I tried to go to Noosa Beach and the National Park but parking was so limited you had to have been there the day before to get a parking spot. Although it is a Tuesday, the theory is that because Sunshine and other south exposed beaches are blown out, all the surfers are here on the protected Noosa Headland where the waves roll in perfectly. The thought occurred to me. Why are these surfers not at school or work? Us pensioners want to go to the beach too. I went to the local Post Office and both mail articles have been held for me. Yahoo! I now have a replacement camera battery and my last three weeks mail. After lunch I rode the bike halfway to Noosa Beach and explored the waterway of Wylah Creek and walked on the boardwalk through the mangroves. Late in the afternoon Ken took us to the river mouth for a stroll. 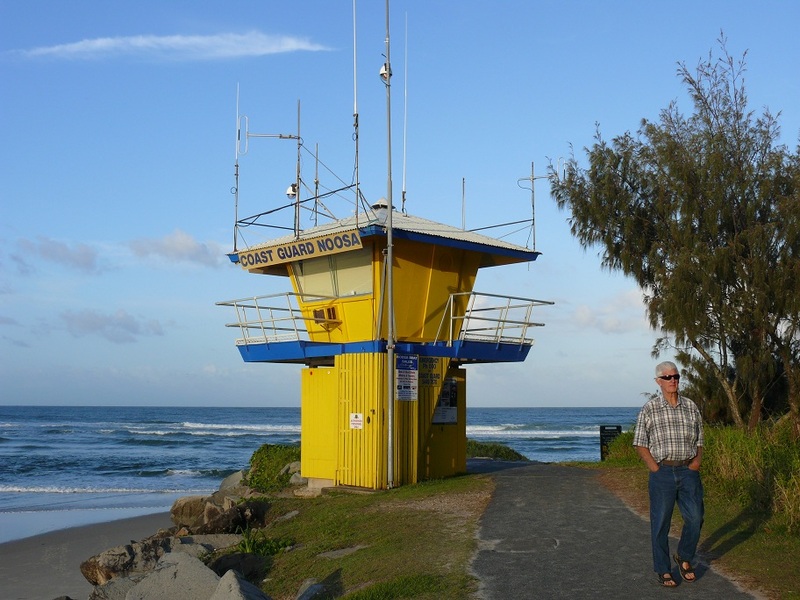 Coast Guard Station at the mouth of the Noosa River. Lots of other people were doing the same including many having a glass of wine or beer and watching the sun set. We also watched a surf boat crew training in the late afternoon. 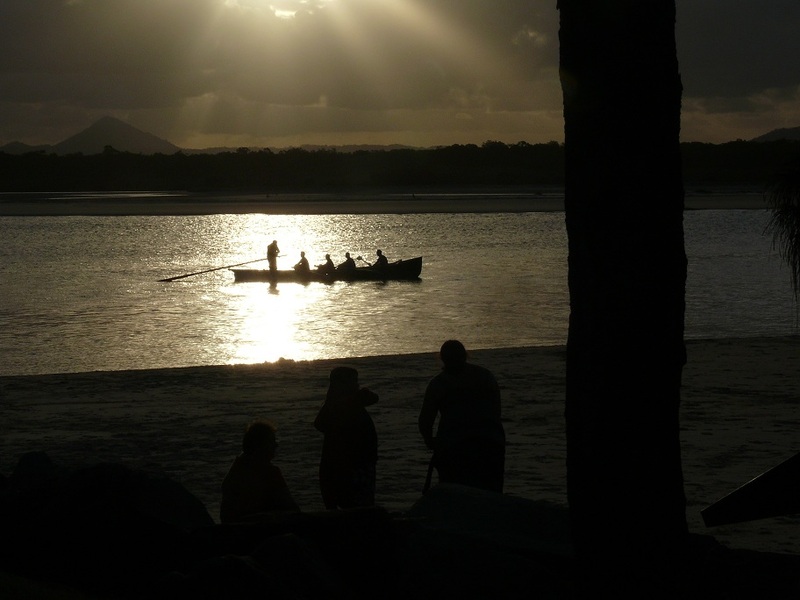 Surfboat Crew training in the late afternoon. 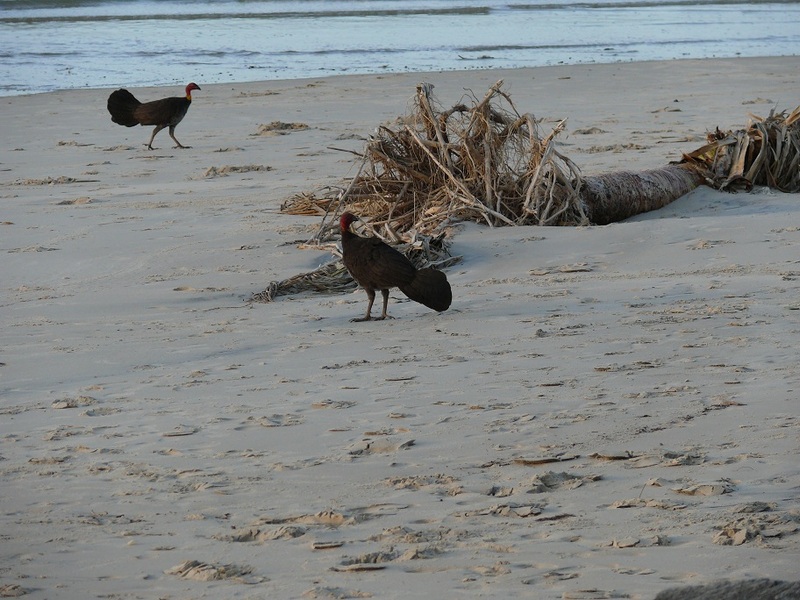 Black Scrub Turkeys on the beach. 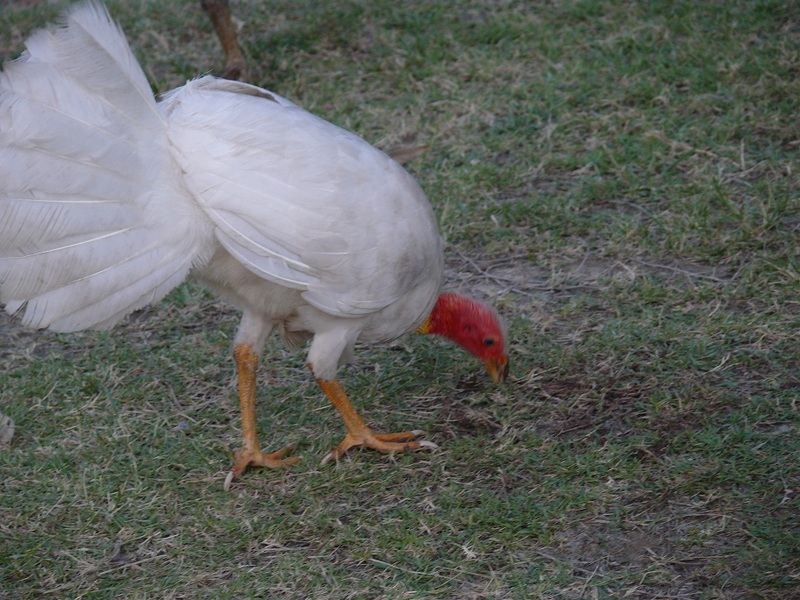 and were surprised to see an all white scrub turkey. I am not sure if was an albino as the eyes looked normal. The first white Scrub Turkey we have seen. Today the plan was to meet up with Don n Guy at Traveston. We will be housesitting until late March. The GPS was trying to take us along little more than 4WD tracks. Eventually I had to admit defeat and call Guy for directions. Sorry Guy but I was not confident with your directions either. He mentioned an underpass railway bridge but when I found one I could see no road sign and ignored it continuing back towards Cooran. As we passed a turnoff with a bridge over a railway line Donnis noticed a street sign which said old Noosa Road as I went zooming past. We travelled another klm before I was able to find somewhere to turn around. The bridge over the railway line was a bit rickety and a little further on was another rickety bridge over 6 Mile Creek. Hmmm! Perhaps there is another way in? Would WWWGO weighing around 4.5tonne be able to get across those bridges? Another 2 klm of steep and winding gravel road brought us to their property. There was no mistake because Guy was waiting on the road. Yes! He said. The way we came was correct and the WWWGO would be able to get across the two bridges. No. We could not come in from the other direction as the railway underpass bridge had a height clearance of less than 3 metres. So. Dom n Guy house sits on a very steep hill and for the most part is still virgin forest except where he has cleared and planted and wrestled with nature to build their wonderful house. Over coffee and cake we chatted and enjoyed their company and we look forward to the housesitting. Yes it is a bit isolated but the towns of Traveston, Cooran, Pomona and Cooroy are not far away. Laurie H left us a lot of notes and maps where the best food places are located. Back in Noosa I tried once more to take photos at the beach. Darn. The parking on the beach and at the National Park is full. I drove along Hastings street to a carpark at the river mouth and walked back along the beach. The wind was blowing but this section is protected from the southerlies. Having said that, the surf was still on the choppy side and after having trudged the whole beach form the river mouth I was in no mood to climb the hill to walk over to the National Park where the best surf begins. Walking back to the car I pondered on this stretch of coast and the number of visitors, young and not so young who flock to this place. If Airlie Beach had surf it would be even more popular than it is now. The rest of the day was spent sorting our luggage and baggage as we plan to spend the next three weeks over the mountains and carrying as little as possible. We have decided to leave the car and excess “stuff” here and collect it all on our return. Oh. The wind continued all day and rain came in scuds. Otherwise the sun was shining – sometimes. I woke at 4.45am and this is getting frustrating. I wake and cannot get back to sleep. The wind is blowing its 20 to 25 knots as it has done for around two weeks. It is overcast and as I started this journal a scud of rain came along. I have no doubt the sun will make an appearance this morning, continuing the pattern of rain, sunshine and wind we have come to expect. I took WWWGO to Bunnings to buy a ladder then back to the house where Donnis was finalising a couple of loads of washing. After coffee we finally got away after 11am. First stop was the Hitch n Go dealer at Forest Glen where he checked out our tow wiring and after looking at their setup we also ordered new gas struts for the roof hatch and a booster tv aerial, all to be fitted by them. We have WWWGO n Terios booked in for the work to be done on 13th December. After that we were on our way but only a short distance to Beerwah where we stopped for groceries and had a great lunch in the shopping centre carpark. After that we started the trek up the range via the D’Aguilar Hwy to Kilcoy. I have an old army buddy, Noel L who lives here but as I did not let him know I was coming and he would be at work we decided we will catch up him and wife Pat on our return. Up and down another couple of ranges and we passed through the towns of Moore, Blackbutt and Yarraman and for various reasons decided not to stay but pushed on via the New England Hwy until we arrived at Cooyar a little town which survives, somehow and has the pub as its hub. I cannot recall seeing a shop or garage as we drove in. Perhaps there is. We set up camp for the night beside the swinging bridge. I kid you not. There is a long suspension foot bridge which seems to connect one side of town with another. We walked across the bridge and the swinging, swaying and bouncing motion was a bit of a challenge but we managed to cross it in both directions. We tried to imagine how Indiana Jones would have fared on this bridge. All the cables and hand rails and suspension is stainless steel wire cable. 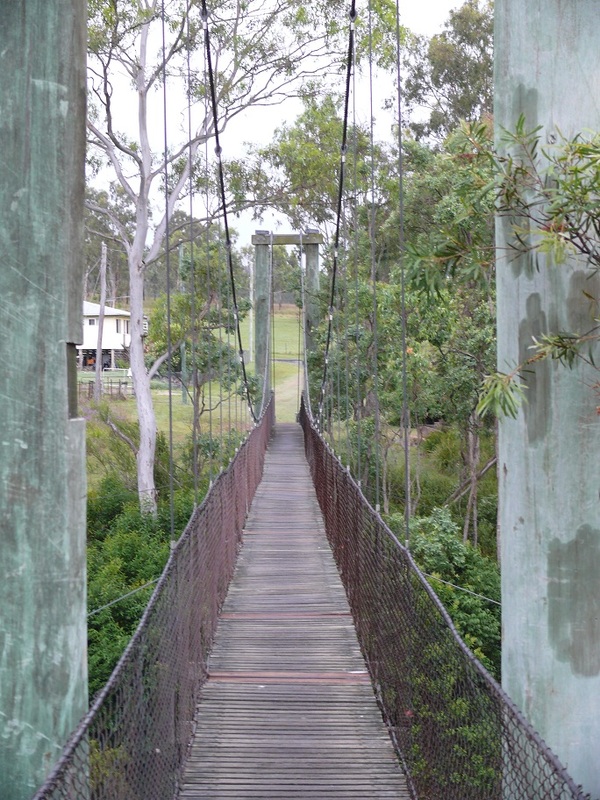 The swinging bridge at Cooyar. The area we are in has cut grass and some gum trees and seems to be popular with the birds. Nearby is grave although this area is not a cemetery. The grave is where little 5 year old Bertha Tebbs is buried. She drowned in 1908 while collecting water. It seems she was running ahead of her mother and on the steep bank slipped and fell into the creek and drowned. A tragic story. 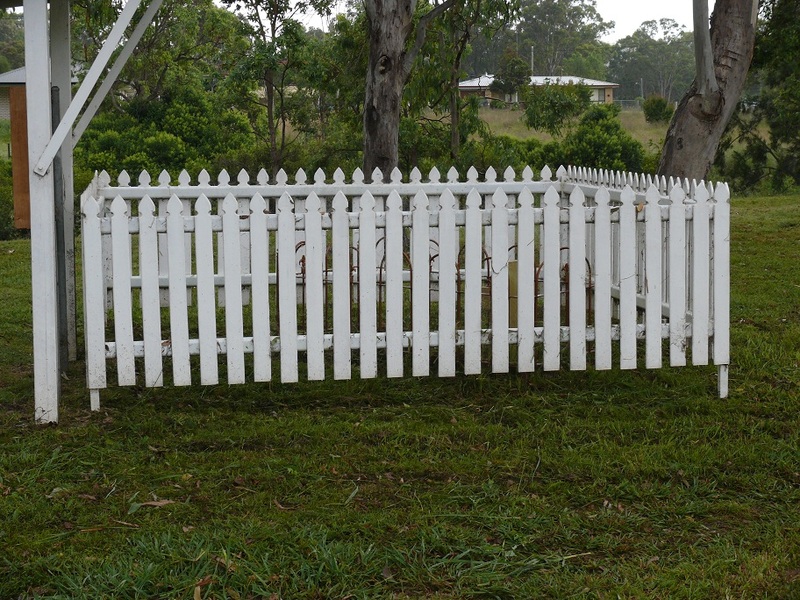 This is the lonely isolated grave of Bertha Tebbs who drowned at Cooyar when she was five. Where we are camped is a sort of an isthmus of land running between two parallel creeks. Light rain was falling when we retired for the night. 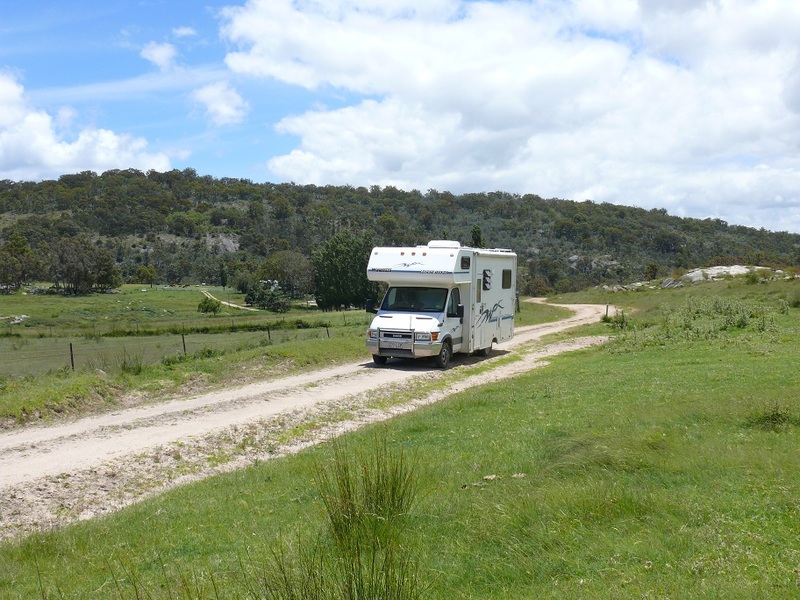 Talking with another camper this morning he informed me the road into Bunya Mountains is not suitable for truck, motorhomes and caravans. There are lots of National Parks within a 100 klm radius of this town so we might be able to plan a bit of National Park camping in this area sometime in the next couple of weeks. He also told me he is a carer for his wife who has Progressive Palsy. 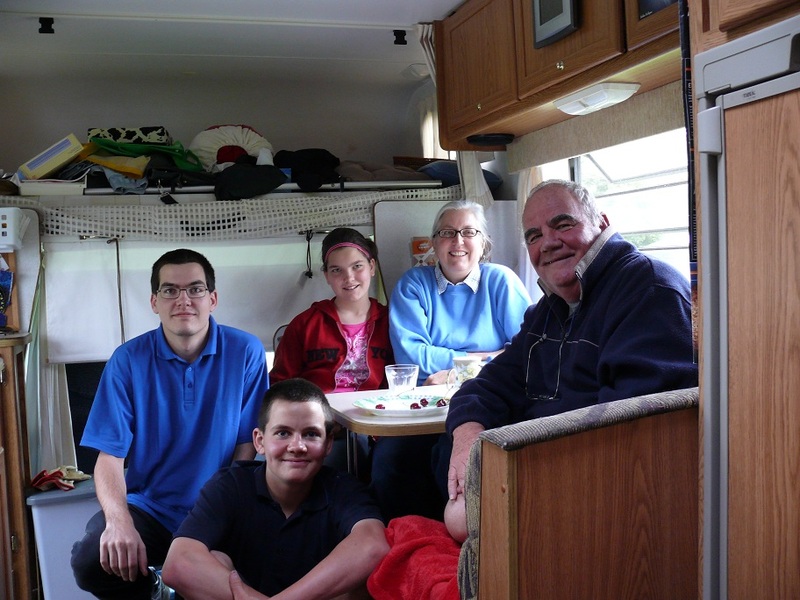 He gets 9 weeks respite a year and takes off in his Mercedes Motorhome for a week while his wife is in respite care. She will not agree to longer than one week. Poor guy. He is lonely and looks for someone to talk with. I listened. We continued along the New England Hwy through Toowoomba, (wow this is a big city especially when you see it from the steep hill coming in from the north) then Warwick and Stanthorpe which is a pleasant little town noted for growing capsicum, stone fruit, apples, pears and cherries. We decided to stop for the night at Wallangarra on the Qld NSW border. This town must be confused as our Telstra mobile phones switch to NSW time although we are still officially in Qld. 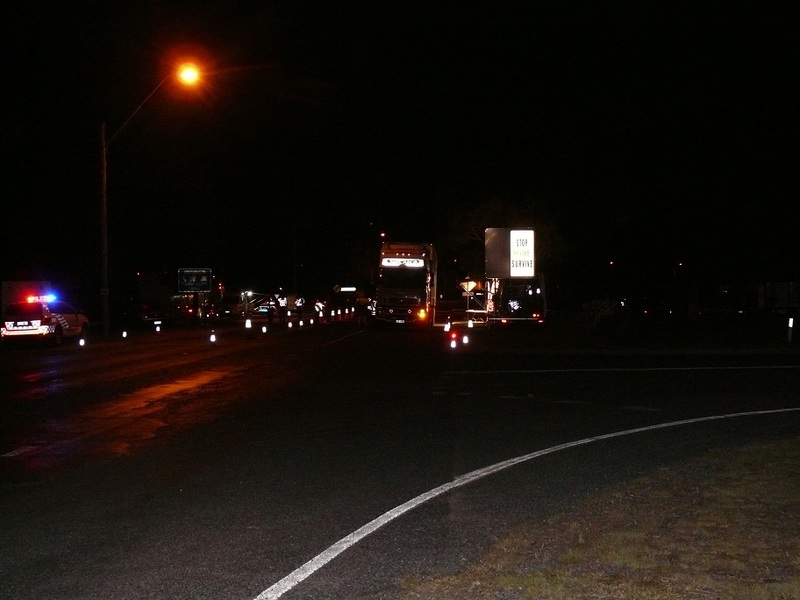 Anyway…arriving at Wallangarra we were confronted by a huge RBT contingent stopping all vehicles. We were looking for the campsite so blew in the breathalyser and continued on but turned around when we saw the welcome to NSW sign. What the!!!! The campsite we wanted is right behind the RBT setup. We could not see the sign because of all the Police cars and mobile RBT buses. At least it will be a nice safe campsite but it will be interesting when all the RBT floodlights are turned on. This is the RBT at night. They spent five days here. A couple of trucks also had to stay for the night due to incomplete log books and the drivers were forced to take an 8 hour break. Some women got charged with drug offences. 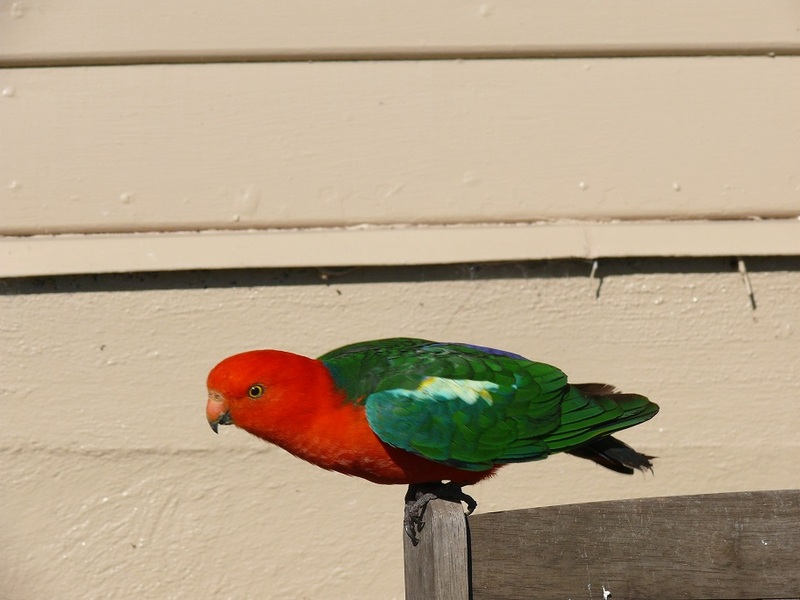 Before we left Wallangarra I went for a walk and got an up close and personal view of a Mountain King Parrot at the local pub. The pub claims to be the last pub in Qld if you are leaving and the first pub in Qld if you are arriving. The also have a giant hamburger challenge just like at Nindigully. I also spoke with one of the police officers at the RBT. He lives in Warwick and has to get out of bed at 3am in order to arrive in time for his shift to begin at 6am. He was amazingly well informed about our lifestyle and knew about dump points and how we find them and the network of freedom campsites. He also commented that there are not enough facilities for the travellers such as us and that we are increasing in numbers. He did admit that his 70 year old mum is a grey nomad so perhaps he gets his information from her. Then again I wondered if some of his information comes from the police department statistics? 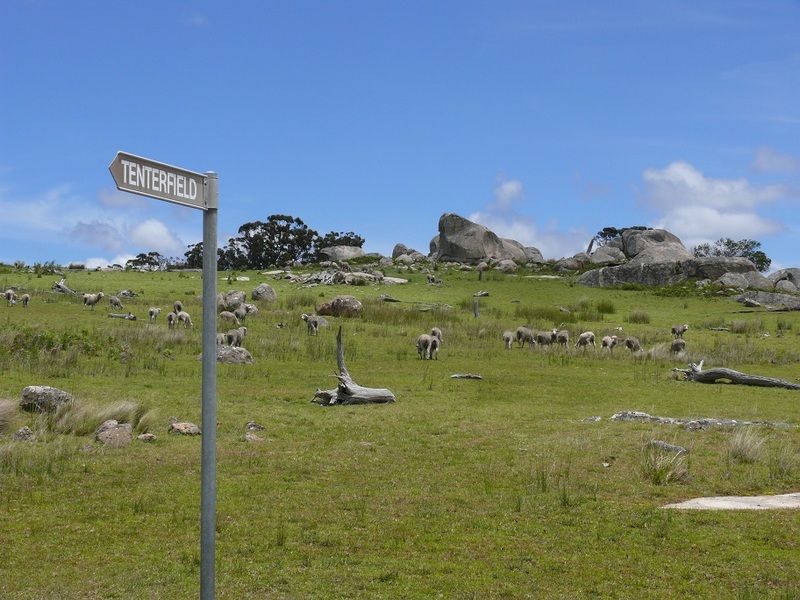 We continued our drive along the New England Hwy and stopped at Tenterfield the birthplace of the nation. We took a side trip out to Mt.McKenzie along a gravel road which was a bit of a challenge but WWWGO was up to the challenge – plus of course some driving skills. More of the Mt.McKenzie track. Our lunch spot on top of the mountain. and although the sun was shining a very cold wind was blowing up the valley. The moaning sounds through the windows reminded me of watching a moody movie set in the Scottish Highlands (Wuthering Heights). 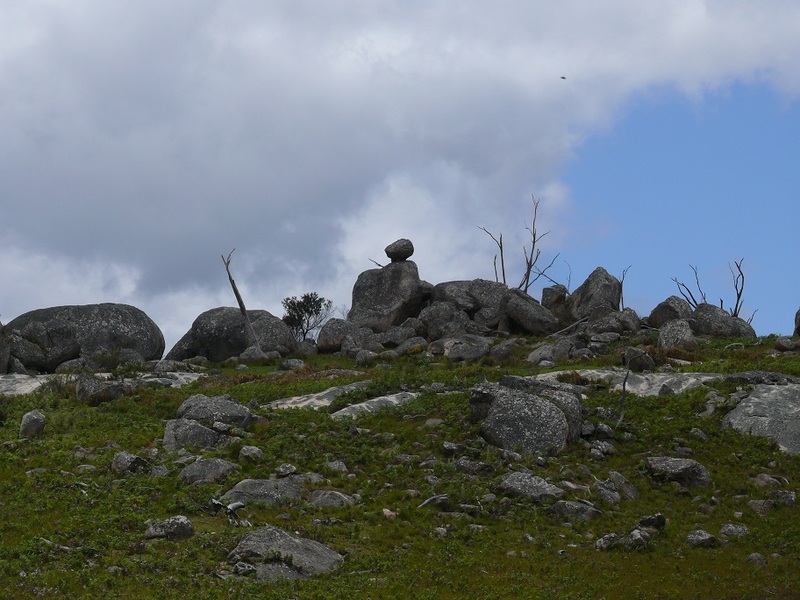 It also reminded me of the top of Australia scenery near Mount Selwyn in the Snowy Mountains. We have been making luncjh with Rye Wraps and heating them in a pan and melting the cheese and adding mortadella and salads and onions and mayo. What a lunch. 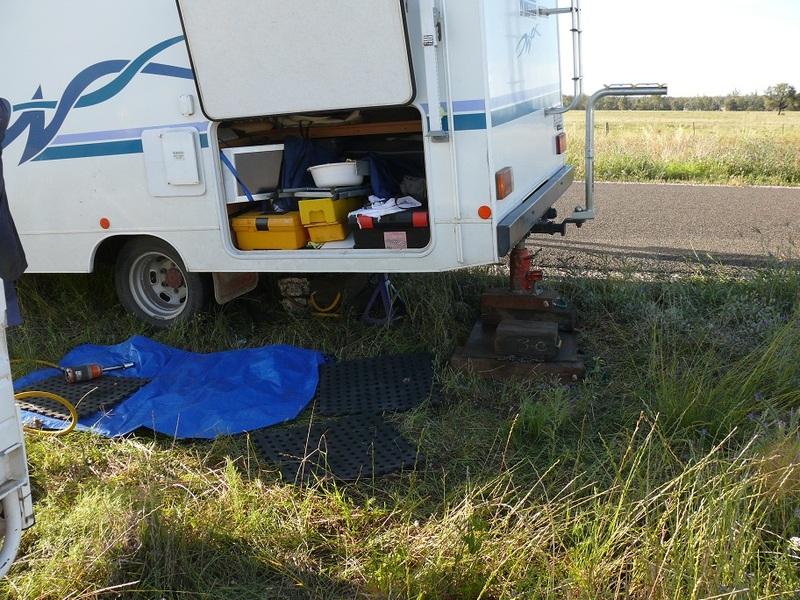 We continued on towards Glen Innes but stopped at a campsite called Beardie Waters about 9 klms out of town. Here we met up with friends Glenise n Eric who are on their way back to Brisbane form their Darling River trip. Eric put on a lovely piece of pork in a camp oven. The Toshiba Twins, Frank n Glenise. At this site we also saw a Windy Loo, only the second such we have seen in our travels. However this is a poor version of the one at Boulder Creek. It is a long drop, not a flushing version. It is about one third the size and does not have a hand basin. Woke at 5.45 to a very chilly and with a cold wind blowing and overcast conditions we expected a poor day. Glenise made a huge lot of scrambled eggs with chopped Red Claw. Pretty good for bush cooking. We continued on the New England Highway to Glen Innes where I bought some engine oil. As I was unscrewing the cap it slipped and dropped down into the dark recesses of the motor. Even with torches neither of us could see it. I crawled underneath and still no sign of the oil cap. I then unscrewed the baseplate and viola! There it was, tucked tightly between the engine and the base plate. After putting the oil in we were on our way again. We were looking for Ben Lomond to visit Greg n Linda. We took the first turnoff which turned out to be a bouncy gravel road which travelled through a pretty valley. After some messing around with the GPS we found the property and caught up with Greg, Linda and three of their children, Justin, Gavin and Alisha. We spent a good hour with all 7 of us in WWWGO having afternoon tea and eating cherries. Justin, Gavin, Alisha, Linda and Greg. A nice family group. We had the chance to catch up over dinner and spend time with the kids walking through meadows of daisies. We are parked in their back yard with power and although there is no mobile coverage they do have satellite internet and I am posting this entry via their WiFi. In the backyard at Ben Lomond. The countryside around here is very pretty and is called the New England area for a reason. It supposedly looks like England, except I suppose for all the gum trees. It was quite chilly when we arrived and Greg informed us that over winter they did have snow and the coldest day was minus 6 and a further minus 6 wind chill factor. Gavin pointed out they are 1330 metres above sea level so a bit of snow in the wintertime is pretty normal. He added they also get some heavy frosts and big hailstones when a big storm passes through. Hmmm. Scrub Ben Lomond from any potential place to settle down! 163. Sunday 21st November 2010. Another quiet sort of week but still, some drama…. Up early and after the usual walk and breakfast started to pack everything away in preparation of the long move of 300 metres. By mid-morning I was moved, set up with power and was setting out the additional shade awnings. One neighbour helped me with the awning on the fridge side while another neighbour helped me with the other side. Later I borrowed a battery drill and finally installed the two clothes lines on the awning arms. I have been planning to do that since Mitchell and have only recently been able to buy the parts. Should have waited until I got here and bought everything I needed at one shop – Bunnings. I also glued the two windscreen washer direction thingys onto the wiper blades. As I was preparing breakfast, the kettle would not turn on. Checked the electrics panel. No power. I walked to the power pole and yep, sure enough, only my power was turned off. I checked with neighbour Adam. About 1.15 am there was a power failure but it came back on during the night. That does not explain why my power switch was off. I did a drive around and bought a carry case for the GPS so it will not get scratched or damaged. Also found the correct fittings for the roof rails so we can install roof racks if required. The man at Auto Barn was going out of his way to be helpful. Also discovered a long Hayman Reece tow hitch for the Terios. We will need the extra long towbar so we can fit the bike outside the spare wheel. WTF…I woke early this morning, around 5.30 and as the sun was up and shining, went on my walk. Whilst walking I was looking at the parked cars and those that drove past to see how they had their GoVia toll tags fitted. Amazingly very few had tags. On my return I noticed nothing amiss, although there must have been. It was not until an hour later when I decided to cycle over to the bathroom that I noticed the bike is missing, presumed stolen. No! It was not padlocked. I have the padlock but never bought a chain. I looked around the vicinity without luck. Then I realised the car was unlocked but a quick look I could see nothing missing. So it was I trudged the few blocks to the Police station to report the missing bike. On my trudge I passed the Redcliffe Bay High School which has buildings on both sides of the road. Careful, a rant is coming on. To quote that media tart politician, “I was gobsmacked”. A million dollar plus bridge has been built from one school building, spiralling up and over the road to the other building. This bridge can only be used by students during school hours after which it is locked up. WTF. This building is paid for by state taxes just so the dear little teenage students do not have to walk out the school gates, walk 50 metres and wait to cross at the lights like the rest of us. That million dollars plus could have been used to help repair the roads in the west of the state. Here is another case where the people of the southeast of the state have money thrown at them while the rest of the state can go jump. The Police were not interested as I expected would be the case. My details were written on a scrap piece of paper and I was told to go checkout Cash Converters. As if. But I did. Went to Cash Converters that is. Yep same model bike except it was in a mens version. Just as dirty as our bike and the price tag was $245! Went to the local bike shop and was told the same bike is near enough to $400 whilst they can sell me another version, out of the same factory, under a different badge, on special for $240. No! That is still too expensive. I cruised to the local Kmart and found a bike with the same gears, brake system but in basic steel, no alloy rims, on special until 24/12/10 for $99. Mens or ladies version. All we need is a bike for convenience not for serious off road mountain biking although the stolen bike was a mountain bike. The $99 speciasl are also mountain bikes with the knobbly tyres. Mmmm. Might put off that decision until 24/12/10. Could be a nice Christmas surprise for Donnis. Donnis flies into Brisbane this afternoon. On my morning walk I usually pass by Humpybong Creek which meanders through Humpybong Park and part of it is on Humpybong Street. Doncha just love that name? It will rattle around inside my head all day. Obviously the locals loved the name too. 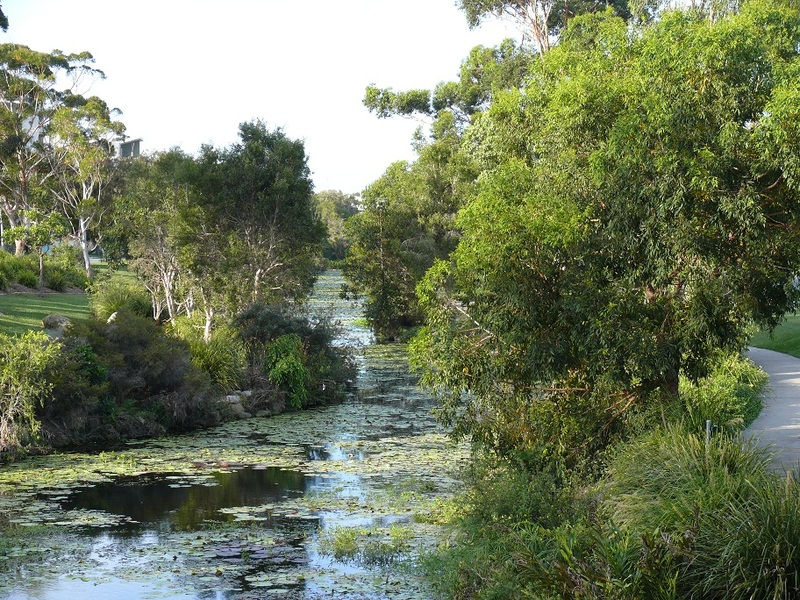 Humpybong Creek. Worth spending a bit more time here. Today I took the path along the creek and found an historical marker to say that a timber weir was constructed here in 1826 to ensure fresh water supplies for the planned settlement. As things turned out the main port ended up being a bit southwest at what is now called Brisbane. Redcliffe is now relegated to 2nd position. Or at least a position below number one. Also whilst walking along the creek I met a number of ducks, of various colours and styles, sitting on the path. As I approached they waddled off the path just enough to allow me to pass. Further on still I was stopped in my tracks and cursing myself for not bringing a camera. A family of Dusky Moorhens were building a nest out of the large lilly pads and the root system of those same lilies. The lillies are also in bloom a rich deep magenta. Mum and Dad were collecting pads and roots and building what appears to be a floating nest. The three chicks were also trying to help and would bring dad bits n pieces to add to the nest. Now, how do I know it was a mum n dad and not a mom n mom or a dad n dad? Apart from the fact they need both to create the chicks! Males n Females are of a different colour. That was how I identified them from our bird book. I was entranced and watched the family for at least a half hour. Darn drat etc for not bringing the camera. Besides the lilly pads were worthwhile photographing in their own right. A storm was threatening all day. I collected Donnis from the airport and the heavens opened up along with hordes of traffic on the motorway. By the time we arrived back at WWWGO it was almost dark and I had forgotten to get something out of the freezer for dinner. Sizzlers is just a short walk down the road but in the heavy rain we drove. Between the carpark and the front door I got soaked and the air con was cool so I shivered during the meal. Once upon a time I could get the salad bar for $6.95. Now it is $21.95 and I was a bit disappointed that the hot soup and hot spaghetti were not. We have agreed to stay another two days as Donnis has obtained approval to spend a day with grandson Chris on Saturday. We need today to dry out as yesterdays rain came with wind so the rain blew under the awning and wet the shoes and chairs which were stored under there. Another cool, windy and wet day. The ****ing new GPS is not working correctly. The voice directions seem to be OK but the map is frozen on the first turn. It is also running very hot. I cannot call Navman until Monday. We picked up Chris just after 10am and had morning tea/coffee with his mum Regelyn. She has to leave for work at Hans Smallgoods by 11am and will not be home until after 8pm. Sooo. We braved the GPS and drove into South Bank. We found the underground carpark. Along the way we passed other carparks, all with a sign out front saying carpark full. However the Southbank carpark did not have such a sign and I found a spot on the first try. 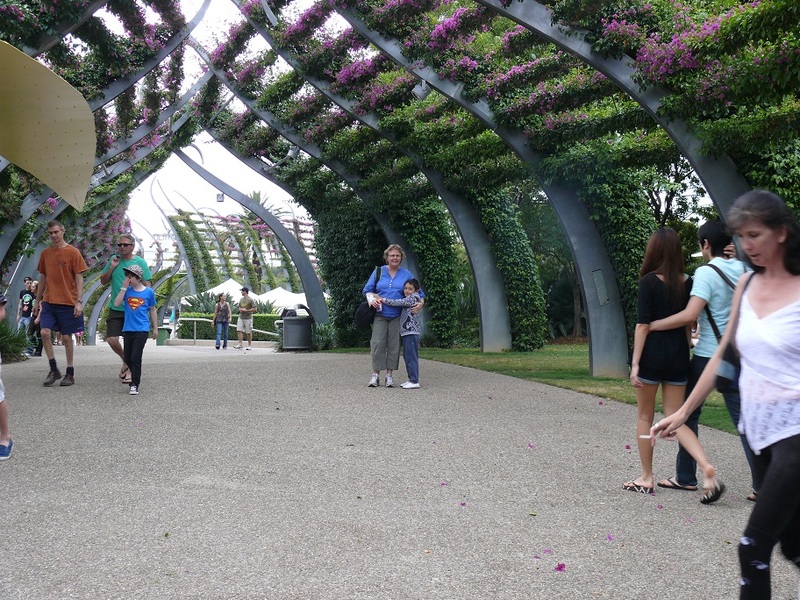 Bougainvilla Arbor at South Bank entrance. 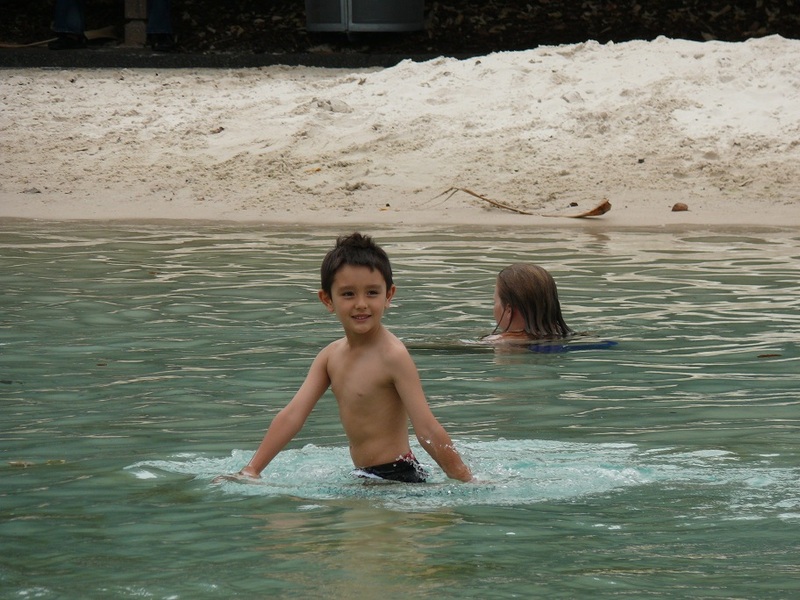 At South Bank there is free entertainment, free “beach” and water fountains and such like for kids to play in. It was wall to wall humanity and the place to be seen if you are young and have an individual hair style or colour. What was particularly noticeable were the gangs of girls in the 13 to 15 age bracket. Usually in groups of five. Of course there were boys wandering around but they were outnumbered by the girls. Apart from somewhere to swim and cool off I really cannot see what the attraction is about this place. I must be getting old. There are lots of choices of eating places. There are lots of market stalls with everybody pretty much selling the same sort of stuff. However I have never liked markets so it all seems the same to me. Ho Hum. Chris loved it at the “beach” and the water features. Chris enjoying the cold water at South Bank. We stayed a few hours until the threatening rain got closer then drove back to Regelyns unit. The ****ing GPS is still playing up. I tried the re-set button several times. Another problem is that when I turn it off it stays on! We made a roast lamb and veggies for dinner and Regelyn arrived home about 8pm so we headed off home. Chris was upset that we were leaving him behind. He had a good day with us and Donnis has promised she will see him again next month. After breakfast and packing up started, Donnis mentioned the markets/car boot sale were on again this morning. As she is not feeling well with stuffed nose, headache and sore throat she decided to rest up before we left. (now if Donnis ever passes up an opportunity to go to the markets she is sick) I went looking for a wire lumbar support one of the other campers bought last week. I found the lumbar supports but something else caught my eye in the distance. A man selling bikes! He had several bikes and one was similar design and features as the stolen bike but it had a sticker which clearly said “Made in China”. It was obvious the man had spent a little time on the bikes as they were all clean, covered in a thin film of WD40 or similar and parts had been painted silver, probably to cover rust. At a price of $50 I thought we would never get a better deal. I called Donnis to come over. She took a test ride, so did I and the man agreed to sell for $45. Sold! Oops! How we gunna carry this thing? The brackets which held a carry bar on the old bike were still attached to the stolen bike. I hotfooted up the road to Kmart but alas they do not sell the carry bars. The nearby bike shop was closed. Sooo, the bike is in the rack, on an angle and we are good to go. I turned on the GPS but within a kilometre the map was stuck. At the first major turn to take us to the Sunshine Coast, as I was exiting the roundabout, the GPS voice was saying “in 500 metres, at the roundabout, take the third exit”. This is not good. I turned it off, then on and turned off the map option and used the turn by turn option and it seemed to work well and did not heat up. However without the map I cannot tell where we are and all the speed advisory information is not available. It did not get hot during this part of the trip. We stopped at Ettomogah Pub for a wee break and had lunch of grilled barramundi and a Beez Kneez beer. We arrived at Sue n Kens house at Noosaville about 2.30. After a welcoming cuppa tea we went off to the Noosa National Park for a walk. This is a lovely, wonderful, great walk. It follows the coastline from Noosa Beach and eventually ends at Sunshine Beach. In fact there are 5 walks in all but I love the Coastal Walk. We walked past wonderful features such as Boiling Pot where we saw a pod of dolphins. Then we continued on to Hells Gates and chose not to continue the walk to Devils Kitchen as it was getting late and the wind was picking up. An extra good feature of this walk is the surfers all along the way. Some of them carry their surfboard all the way from the carpark and have to climb down steep cliffs to get to their surf spot. By the time we got back to the carpark we all had tired wobbly legs and my left knee was protesting but what a walk. Love it. Might do it again this week as we will stay until at least Wednesday night to allow Donnis to rest up and recover. We also have arranged to have coffee with Dom and Guy at their property on Wednesday morning. Perhaps I can get the GPS sorted out this week as well. A big storm passed through at midnight last night. The wind and rain started a little earlier but at midnight there was lightning and thunder. We had packed most things away a few hours before so felt comfortable we could leave in the morning without too many things to be done. Although it took ages to get back to sleep, with thunder and lightning every few minutes, we did get back to sleep. Only to be woken just before 6am with an almighty bolt of lightning which both of us saw through closed eyelids. The Thunder erupted at the same time and rain by the bucketload dropped on us and started little rivulets and puddles within minutes. We dressed quickly and decided to get into town and dump our black water before breakfast. It was then I realised the ramps under the front wheels were still…under the front wheels. I also realised the stabilising jacks were still in the down position. So… wearing my bright yellow rainjacket I was on my hands and knees in a puddle of mud, winding up the jacks. Still, we were on our way before 6.30 am. The plan was to get as close to Ballina within a reasonable hour. 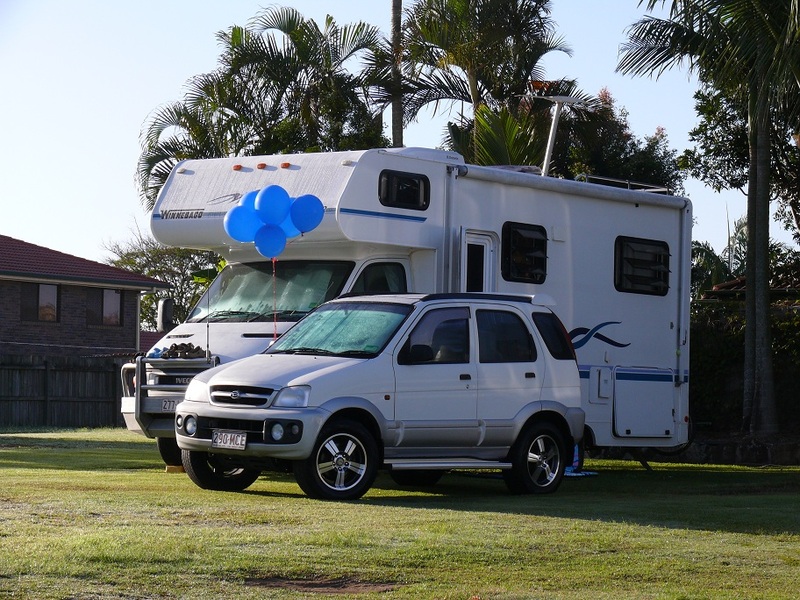 So, after dumping… whilst standing ankle deep in cold running water… we drove into Bingara and parked and ate breakfast. We headed out of town and passed through the following wonderful towns which we will have to explore in the future. 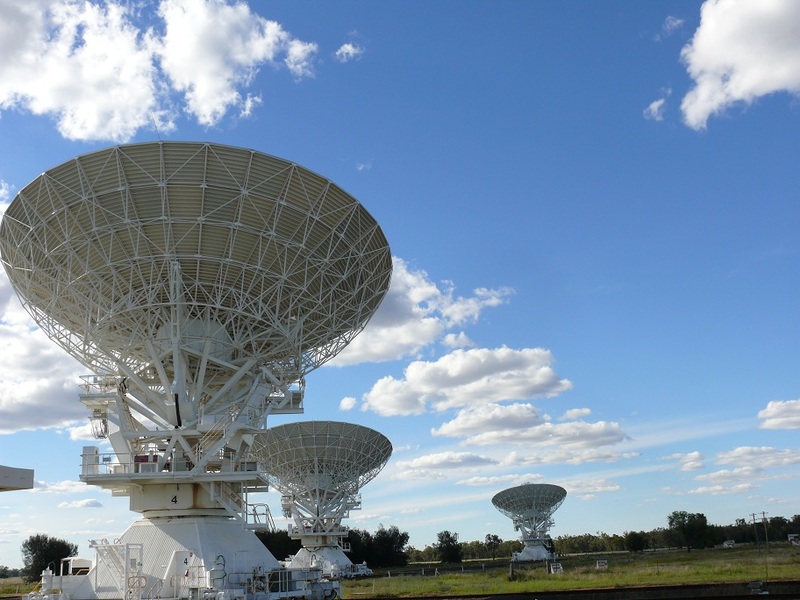 Inverell, Glen Innes, Tenterfield, Casino, Lismore and Ballina. Cheapest fuel since leaving home almost two months ago was on the outskirts of Glen Innes. We crossed the Great Dividing Range which went up, up, up, down, down, down and around corners for around 50 klms. It felt like we were driving in Tasmania. We stopped in Lismore to get a gas cylinder filled as it had run out on Saturday. We reached Ballina at 4pm so decided to push on to Byron Bay a place neither of us had visited previously. As it had been such a long day (in fact 12 hours since we were rudely woken until we got settled into our site) I suggested we stay at a van park and go out for dinner. Yikes! One night was $40. We also experienced high humidity, the first time since leaving Airlie Beach almost 2 months ago. Dinner was a disaster and we got lost and could not find our way back to the van park. We had come out at sunset and did not bring the handy map the van park gave us. We could not remember the name of the van park. Eventually I recalled it was beside the old railway line so we finally found the railway line and followed it until we found the van park. 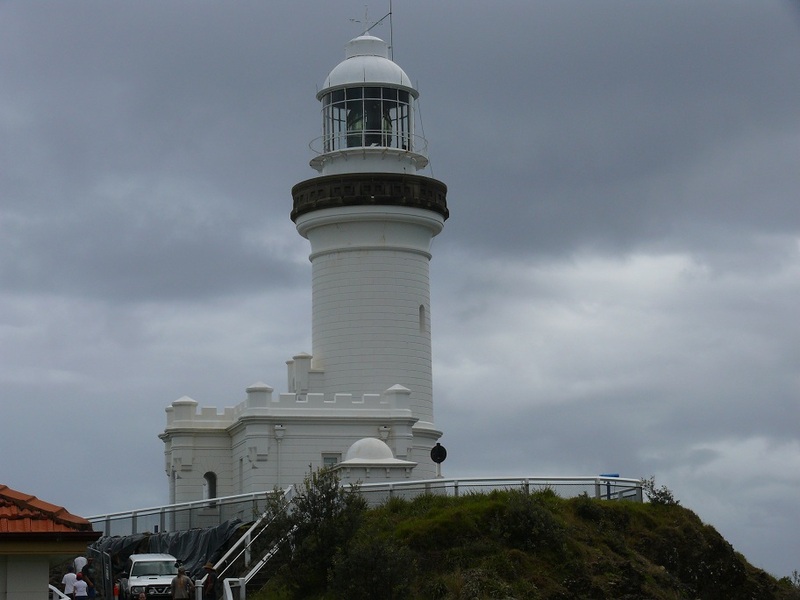 The lighthouse at Cape Byron. This was the only photo we took whilst in Byron Bay. The ranger wanted $8 just to park the car for a few minutes. only to be caught up in the traffic again. Byron Bay is not my kind of town. I guess 40 or so years ago it probably would have been but it is even more of a party town than Airlie Beach. Last night while waiting for dinner we went for a walk along the main shopping streets. Most of the shops were open and people were everywhere. It rained last night and rained again as we were leaving and continued on and off all the way through to our destination for the night. Coming over a hill near Tweed Heads the whole coast area to Surfers Paradise was laid out for us to see. Wall to wall roadworks, building works, cranes and traffic. No way. Repeat, no way could I ever live in a place like this. After spending so much time driving in the outback and noting the condition of the roads which provide food and mineral wealth I am appalled that there is little funding for outback roads. However all the way through to Brisbane there are roadworks, major roadworks in the south east corner. In the outback if a pothole begins it could be months before local councils can get around to dumping a small load of pitch and gravel in the hole. It seems that in the southeast if a pothole occurs the government throws money at it in the shape of digging up the entire road and putting in new lanes. It seems unfair. I know there are population differences but our food and wealth come from the outback, surely they deserve better roads. The traffic into Brisbane got heavier and heavier so I was relieved to eventually find Brisbane Holiday Village, our home for the next two nights. Expensive but probably the best presented van park we have ever been in. Tomorrow we have to find the car yard and complete the deal. I set up the address of the car dealer on the GPS and we headed off. About 3 klms from our destination the GPS failed. I tried several times to re-set and re-activate the GPS. It would not work. Sooo… on the iPad I have a Maps icon. I clicked and opened the maps and instantly it located our position and set up a route to follow and within minutes we had arrived. Long story short we now have a 2005 white Daihatsu Terios. The Terios. Note the ballooons given to us by the sales lady, Fiona. They floated away the next morning while we were breakfasting. The excitement of the new car is offset by the sadness of losing the Subaru. The Subaru quality finish and standard fittings is superior to the Daihatsu. We have both owned Daihatsu in the past and they have served us well and are economical to run. It is sad though. Goodbye dear Subie. The excitement was also tempered by trying to drive back to Brisbane Holiday Village without the GPS but we used the iPad which has been so worthwhile and instrument to have. We did make a wrong turn at one stage but I recalculated our route, in the same way a GPS would do and had us back on track and home to WWWGO with a minimum of stress. However I will look at a replacement GPS, probably a Tom Tom or Garmin especially as we will be spending some time in Brisbane over the next few months and a month in Sydney next May. The iPad with maps is great but does not do what a GPS does and needs one person using the device while the other drives. Tomorrow we will leave here and move over to Redcliffe Showgrounds on the northside of Brisbane River. It is closer to the airport and will not involve using toll roads. Thanks to another park camper giving me simple directions, the trip to Redcliffe was easy, without problems. Laurie H called on the mobile and I was able to answer on Bluetooth while I was driving. She gave me the street address of the showgrounds. We drove to the beach and had a coffee. We put the street address in iPad Maps and we were at the showgrounds in a few minutes. On arrival the caretaker informed us there was a Boy Scouts Rod and Custom Car and Bike Show on over the weekend. All campers will have to move to another part of the grounds tomorrow. We took the opportunity to go to Harvey Norman to look at GPS, Bunnings to look at some shaving cabinets and a bit of shopping. At dinner I realised we forgot to observe Remembrance Day at 11am. Moved WWWGO to our new location about 8.30 and discovered although we have power, water & toilets the showers are in the old section and it is a 500m walk. Parked near us is the Potato Man. For those of you who have gone to the local shows around Qld and NSW you might recall the Potato Man who sells oven baked potato with a variety of toppings. His van is always a black with gold handles, looking like a railway engine with trim. He has been doing the show circuit for 27 years. He sold to Adam two years ago and Adam is in the process of re-building the entire kitchen. After lunch I drove Donnis the 40 klms to the Brisbane airport. It was an easy drive and return. On my way back I stopped at Supacheap Autos and bought a Navman GPS. Donnis arrived in Sydney to visit granddaughter Amelia and I had happy hour with a few other campers. That was our day. Be prepared for an exciting entry folks. I dragged the washing machine out of the Terios and connected power and water. As it is only a small tub I needed to do 4 loads of washing. I also strung some clothes line under the awning and hung the washing out to dry. I drove to another shopping centre, mainly to find the Post Office as I am expecting an eTag to arrive so we can enter tollways anywhere in Australia. I suppose you could say this is a lay week where we get housekeeping and other chores completed. I have no idea where the rest of Saturday went but at least I got the washing dried, folded and put away. I cooked up a batch of chilli con carne for dinner and settled down to watch the finals of the Four Nations Rugby League. Sob, New Zealand scored a try in the 89th minute and won the game. Donnis sent photos of her holding Amelia. 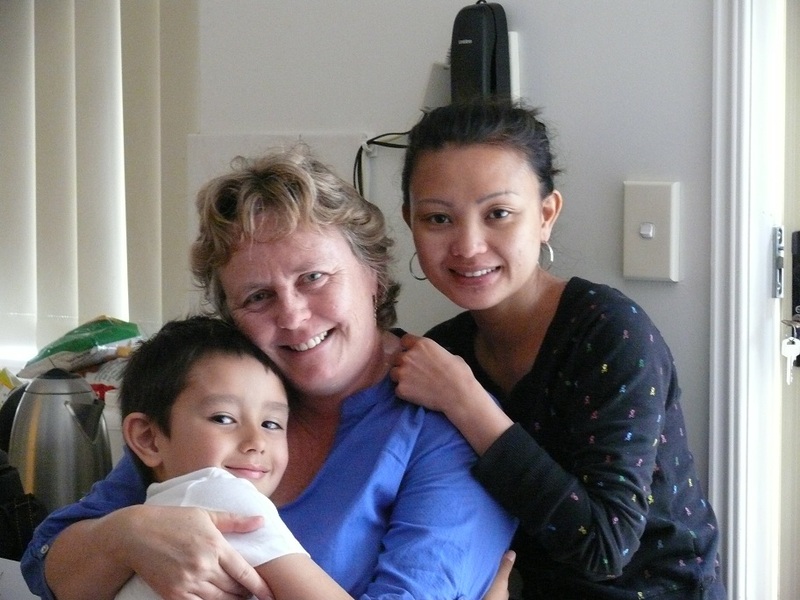 She is glowing – Donnis that is – she looks like a mum holding the baby. Drove to Noosa Heads today to visit sister Enid and her husband Ken. They have been doing some major renovations to their house and I must say it is looking fabulous. It also gave me the chance to test out the new GPS as well as the Terios. I am getting used to driving it and look forward to trying it out off road. It rained quite a as I was leaving Redcliffe but by the time I arrived at Ettamogah Pub the sun was peeking out from behind the clouds. I stopped for a coffee and sausage roll at the famous pie shop. They are now part of a chain called Mr Beefy. The sausage roll, at $3.70 is the dearest I have encountered anywhere in two states. It was also tasteless, the meat filling had the consistency of paste. Rather disappointing really so I completed one of their feedback forms. It will probably be the last time I go to Mr Beefy. Has a great barbecue lunch with my sister then we visited our Uncle Bill at the nearby nursing home. He is very sharp and up to date with what is happening in the world but his conversation is liberally sprinkled with recollections of the past. He is writing his memoirs. I had a great visit with Enid (or Sue as she prefers to be called) and left late in the afternoon to arrive on dusk back at the van. I noted that many of the rigs have now moved back to the other side again. Sigh! It looks as though I will probably have to do the same thing tomorrow. Now that I have had a chance to drive 300 klms in the Terios I noticed the little things that make a difference. The Terios does not have cruise control, electric windows in the back and no thermometer. The foot well is quite narrow and probably explains why the previous owner removed the foot rest. It not as fast or as quick through the gears so I will have to learn to drive a bit more sedately and not race car drive through the gears like we could do in the Subbie. It also does not have a drink holder fitted nor a centre console or a device which automatically turns off the lights when the ignition is turned off. On the way home I turned off the air con, opened up the sunroof and the passenger window. It would be great to drive that way especially in the outback with low humidity. So far from the small tank of fuel I have driven 350 klms and still have a third of a tank. I will do some calculations on fuel consumption but expect around 500 klms to a tank. It was cool last night and I slept all the way through until about 6am then went back to bed until about 7.15. We saved this fresh water tortoise on the road at Burren Junction. the locals commented the storm had finished only 15 minutes before as it continued east. We will stay here a couple of nights. Tomorrow we will wash the car ready to photograph – we are looking at trading it in. There are free hot spa baths where we are camped but we did not try them tonight. We considered going to a historical property about 60 klms away in a place called Rowena for a Melbourne Cup event but at $25 per head feel it is a bit out of our price range. 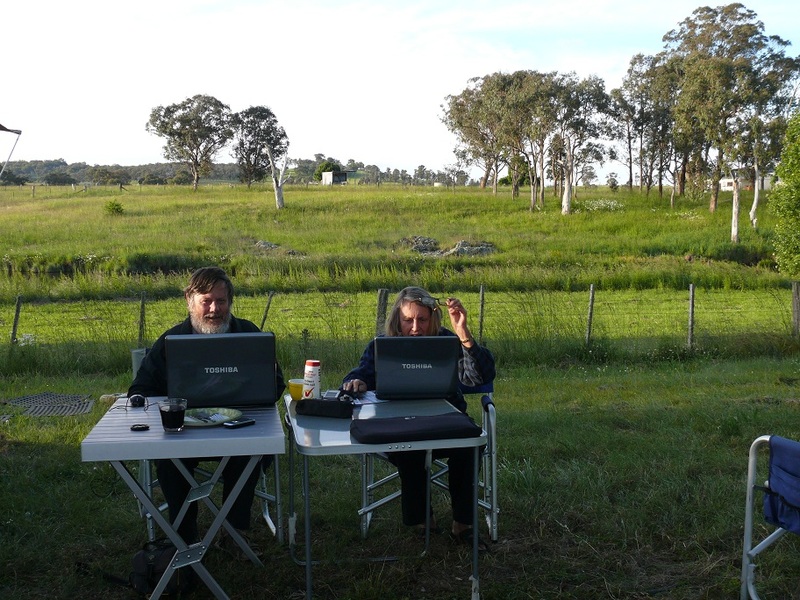 We are in a paddock about three klms out of the village and have all the digital tv stations. The first time since we left the coast. Usually there is only analogue tv out here. We will watch the Melbourne Cup on our own tv and have chicken loaf on rye toast for lunch. Tuesday 2nd November – Melbourne Cup Day. It was cold overnight and we had put a 2nd blanket on the bed before we retired. It was needed. I woke at 4am and had trouble getting back to sleep. Lots of thoughts were crowding my mind. I could only snuggle under the blankets to keep warm and eventually fell back to sleep. I woke at 6.45am to 10° and rugged up to take a brisk walk along a nearby dirt road. The wind blew from the south most of the day. It was a cold wind and strong. It was shaking our awning pretty badly so we took the awning down. Due to the action of the wind the awning could not roll up straight as it normally does. I took three attempts including Donnis having to climb on the roof to help the process. We washed the car, emptied all the gear and we took photographs then sent them by email to the dealer. 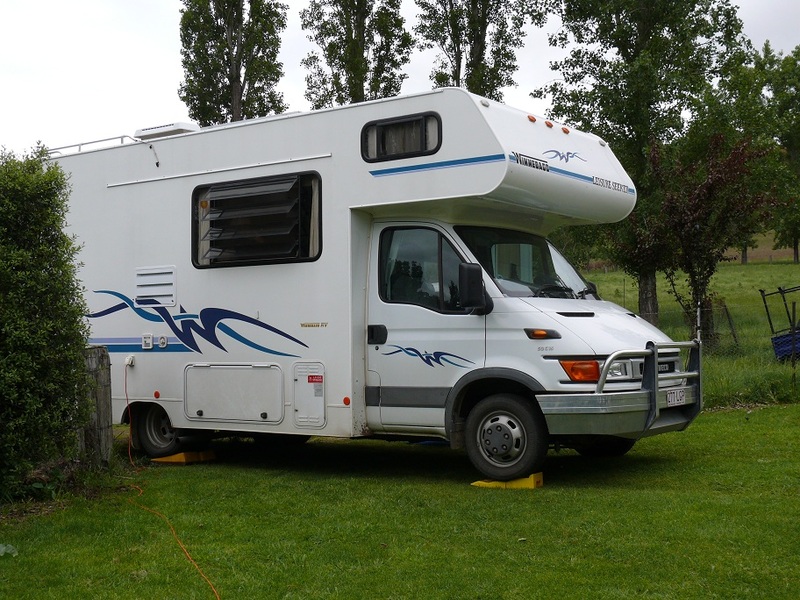 A man camped next to us is towing an old caravan with the same vehicle as us, namely a 2003 Iveco Daily. The van part is filled with his electrical stuff as he has a huge solar panel array on the roof. He also carries a Canadian Canoe and a couple of mountain bikes. When he came over to introduce himself he brought a notepad on which he had written his introduction. Part of his introduction said he can hear perfectly but he cannot talk as he has MND. Paul, then wrote another note to explain MND is Motor Neurone Disease. I knew a work colleague who had MND and he died within 18 months of diagnosis. Paul, has had 18 months and he still rides his bikes, paddles a canoe and bushwalks, all by himself. He also travels by himself. He is fighting the disease. He can only communicate by a series of grunts, signs and handwritten notes. He has a sort of laugh. He can still laugh. He dribbles a lot and that is a sign of the advanced MND but he still has other muscle control. We wish him well. We watched the Melbourne Cup in glorious HD Digital TV and had our chicken loaf on toasted rye sandwiches washed down with a shared beer. Later in the early afternoon we took the plunge in the hot spa. Ummm. Perhaps that should read warm in places spa. The water coming out of the pipe is hot but quickly cools down. The wind chill was considerable so we stayed chin deep. Afterwards we showered in lukewarm water and hid from the wind the rest of the day. The spa water must be good though. I fell asleep afterwards. Our second sunset at Burren Junction. We were beside the evaporation ponds and there was a great deal of bird life to watch. This settlement started out as a railway siding for the wheat and wool shipments. The community was a series of tents beside the track but now has about 50 homes, an RSL, a pub, a Post Office and a General Store Garage. There was once a craft shop but goodness knows who in the 200 person community could buy enough craft stuff to keep the business open. I woke at 6am to an 11° morning, thankfully brilliant sunshine and no wind. I went for a half hour walk along some dirt tracks nearby. At one stage I was near the railway line and could hear a car coming in the distance. The land is so flat sound travels without interruption. It took minutes for the car, on the highway, to reach my position then there was a different sound as it passed and continued travelling away from me. We are camped beside a large man made pond. It has lots of birdlife in and around it. 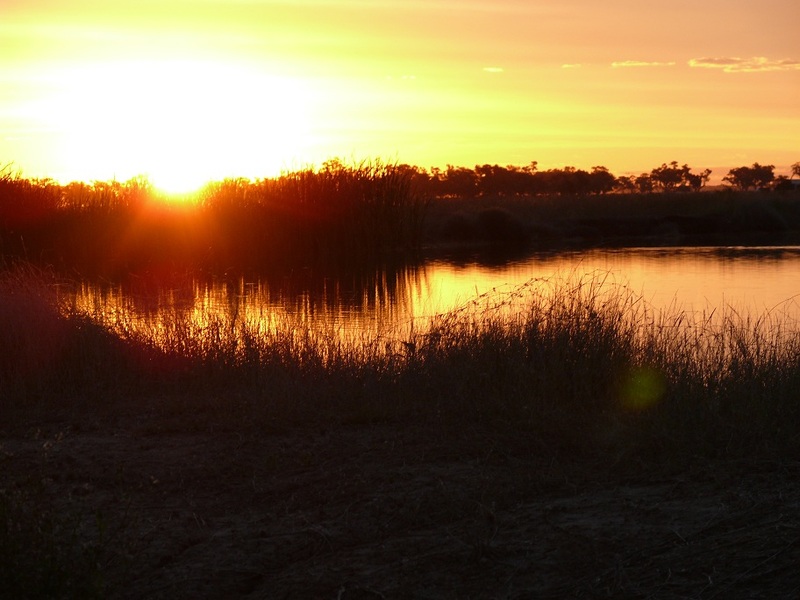 During the day we decided to travel 38klms to the town of Pilliga and checkout their hot artesian spa. 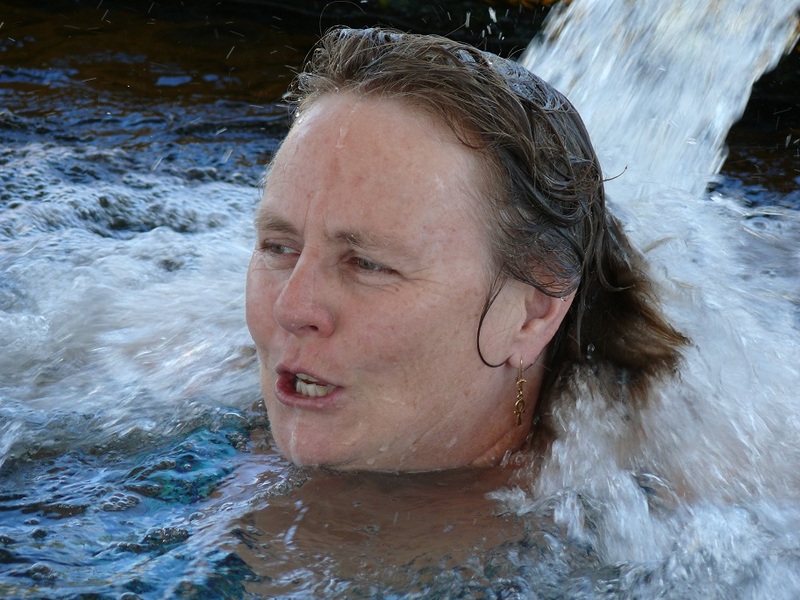 Donnis enjoying a hot water massage at Pilliga. The other three telesopes are on intersecting tracks. We have decided to head out to Bingarra via Wee Waa and Narrabri tomorrow, stopping at Narrabri for a big shop at Woolies. Up early this morning and we were ready to leave Burren Junction by 9am. I needed to empty the grey and black water tanks. We finally found the local dump point. I now have a new worst dump point. Yep. Burren Junction. 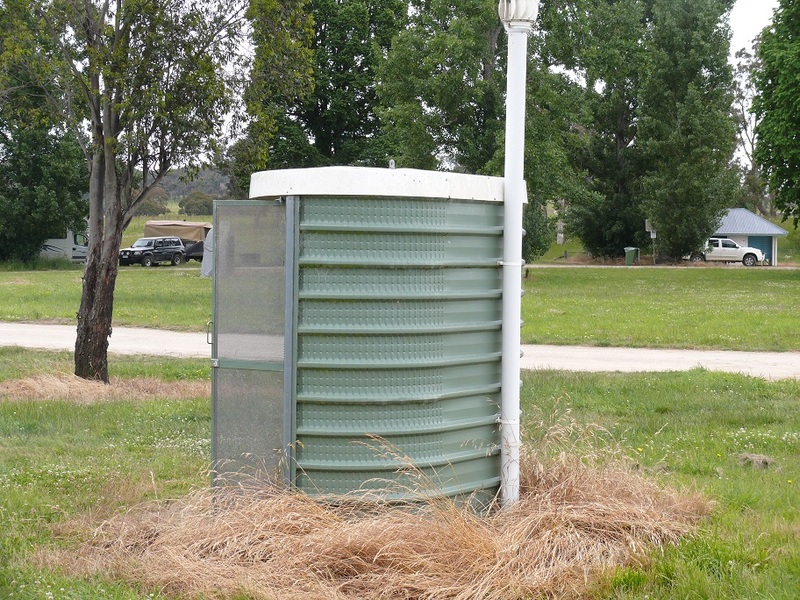 The dump point is a choice of two septic tanks which have a hole in the top. Because the tanks stand a metre above ground level they are no good for grey water. After dumping the black water I attached our own hose and fittings to the tap on the other side of a fence and turned it on. What the??? No water! I went into the toilets and turned on a basin tap. No water. I ended up using water from our own tank into a bucket and washed down the cassette and septic opening. We travelled to Wee Waa and stopped at a park for coffee and discovered we had stopped, by accident at a park with a modern dump point. Although I did not need to dump I took on water to fill the fresh water tanks. We then travelled to Narrabri to take on a big grocery shop and top up with fuel. This seems like quite a nice town and we would like to explore it some more one day. We also are not that far from Coonabarrabran where cousin Bobby & his wife Dianne live. Regrettably we will have to leave a visit to them until another time as we need to be ready to put Donnis on a flight to Sydney, preferably from Moree. Errol is arranging a flight. So we planned to spend our time heading to Bingarra and looking at that area until a flight is ready. 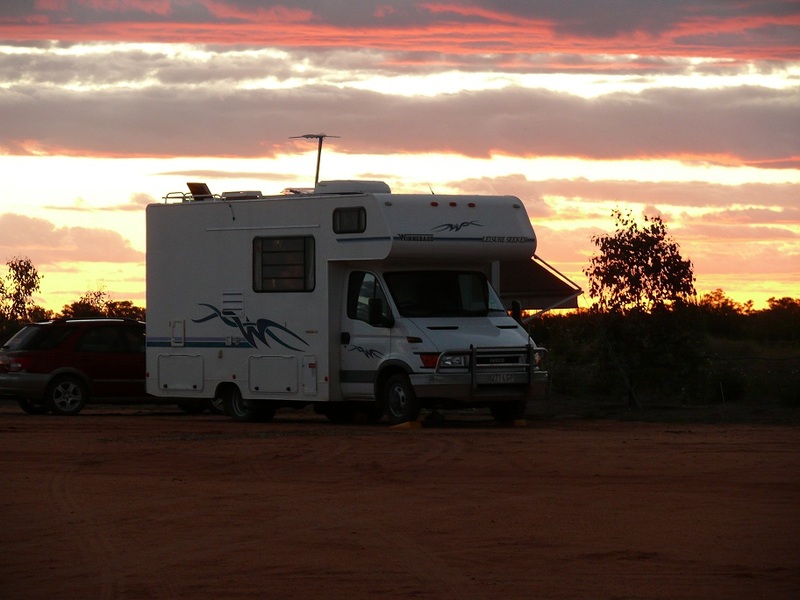 I will book into a caravan park in Moree for a week while Donnis is in Sydney. 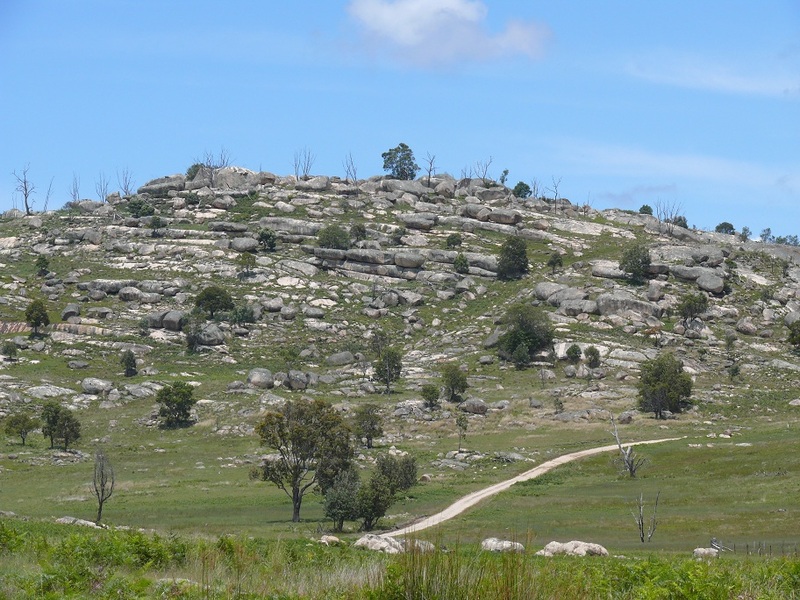 First we planned to stop at Sawn Rock before stopping to camp for the night at Rocky Creek. A few klms from Sawn Rock I had a blowout ( well not really a blowout more a shredout and boy did it make a lot of noise) in WWWGO where the passenger side inner rear tire shredded. Amazingly the tire was still inflated. The tread was peeling off. I called RACQ in Qld who arranged for a local tyre service to come to our aid. We were parked half in a spoon drain and on a slope. The tyre man arrived and proceeded to jack up WWWGO with an air jack, a hydraulic jack and a safety jack. After removing the outer rim he discovered the inner rim was stuck on the axle studs and the jacks were ever so slowly sliding sideways. UhOh! He called his main shop and a second vehicle came out. By now we had two air jacks two hydraulic jacks, one safety jack, about a dozen wood blocks, a thick steel sheet and wheel chocks in place just to get WWWGO stabilised and the offending wheel off and replaced. Some of the equipment needed to replace our tyres. Oh, by the way, we could not get the spare off. Sometime in the distant past the nut and bracket mechanism holding the spare in place had been bent over. It will need a panel beater to remove the bent bracket. They finished about 6.30 and we found our way to a caravan park in Narrabri. We will stay here tonight and go to their depot tomorrow to have the spare sorted out, another new tyre put on and extension valves put on all rims. If luck is with us we will be on our way again tomorrow afternoon. Oh dear me. Some days can be so trying. Today dawned cold, windy, overcast and a foreboding that my wallet was in for a difficult time. We dropped WWWGO off at the tyre service and took the Subaru off for a drive around town. We picked up a few items which were still on our shopping list then went for a walk around the main business centre. We like Narrabri. It is a good size town with good clean public spaces and amenities. There are wide streets. We could not see one shop with shutters. Only a few shops were empty but by and large there were lots of people out shopping and the town felt vibrant, alive and confident. It seems the town is on the new route from Melbourne to Brisbane and there are lots of trucks coming through town. In that respect I would think a by-pass would be in order, sooner, rather than later. The geological feature known as Sawn Rock. a geological feature from the age of volcanoes around 18 to 21 million years ago. Here is some information from the Narrabri Information Service. Keen to experience an almighty wall of organ pipes without stepping foot inside a church? 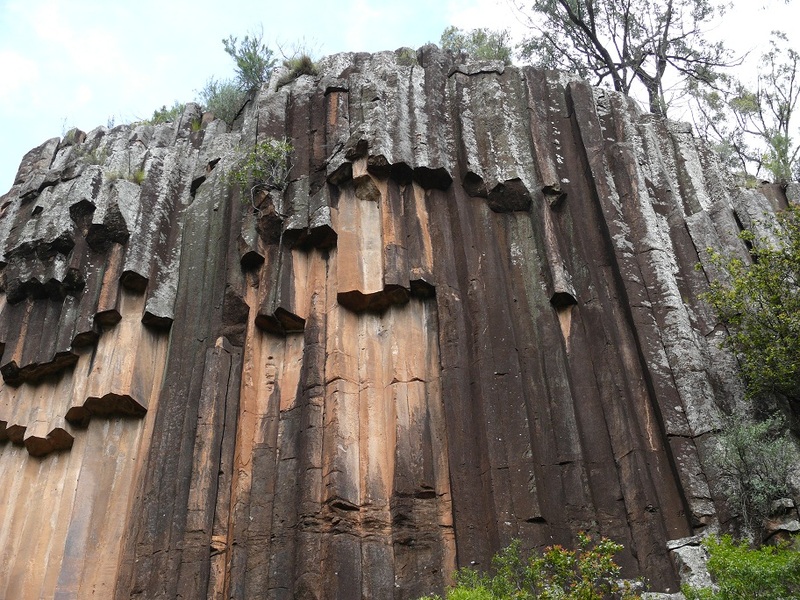 Then Sawn Rocks, with its towering wall of pentagonal basalt pipes is the place to go. Undoubtedly the most iconic reminder of Kaputar’s volcanic past, this rock formation is located in the northern section of Mt Kaputar National Park. This unusual phenomenon is the result of slow and even cooling of molten rock, enabling individual crystals within the rock to align perfectly with each other. When we arrived back at WWWGO the first big drops of rain began to fall. We still had a twisting and steep range to climb and I was a bit concerned about the rain. Once we were over the other side the rain eased off although there were a number of places with creek crossings, thankfully no more than 30cm deep. Somehow we missed the Rocky Creek campsite however there were several crossings of Rocky Creek and none had signs of other campers. 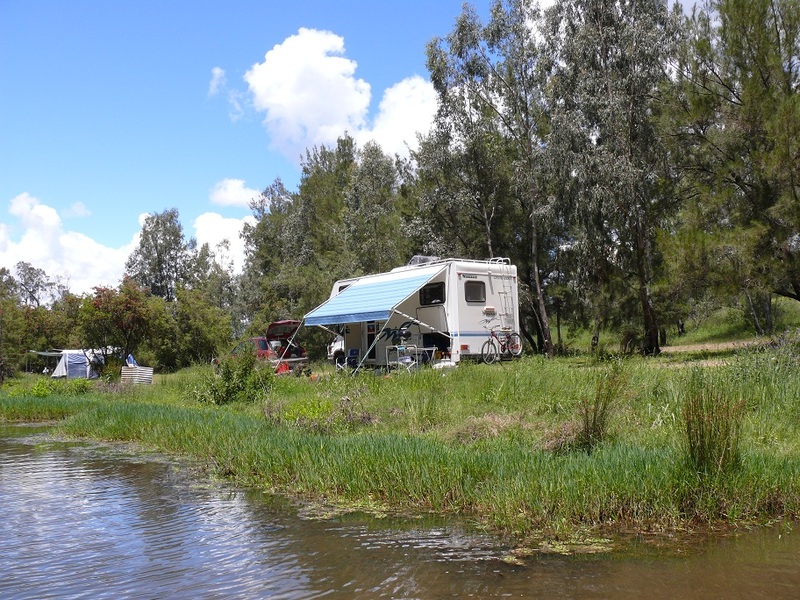 We travelled into Bingara and finally found Keera Road on the way to Copeton Dam and found a delightful campsite on the banks of the Gwydir River. 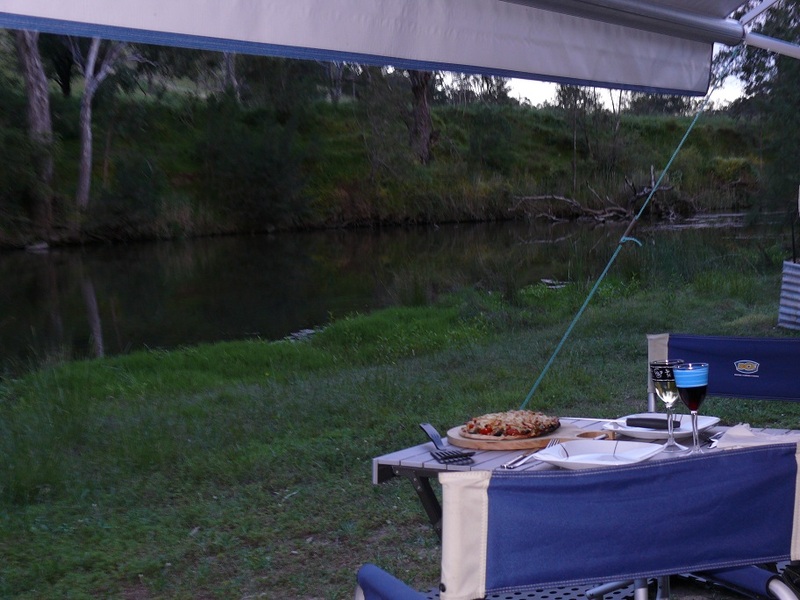 Here we are camped on the banks of the Gwydir River. We immediately threw out an anchor and will stay here at least three nights. The river is teeming with bird life and tomorrow we can have a look around. After a somewhat cool two blanket night a delightful sunny day followed. In fact sunny enough to prompt me, yep that’s right, me, to volunteer to go for a swim in the river. After the swim we took a cake of soap and had a bit of a bath. I did a Tandoori Chicken in the Weber barbecue for our lunch. (the plan is to eat our main meal at midday and a lighter meal in the evening) We also did a walk along the river bank and took a call from the car dealer. We are moving closer to a deal and we will change our plans once again. Current plan is to leave here on Monday morning and head as far towards Brisbane as we can comfortably drive with the intention of arriving Tuesday evening and seeing the dealer on Wednesday morning. Once the deal is done (fingers crossed) Donnis will catch a flight out of Coolangatta. I will stay in a caravan park for a week. Today was a long lazy day. I drove into Bingara to find a dump point. 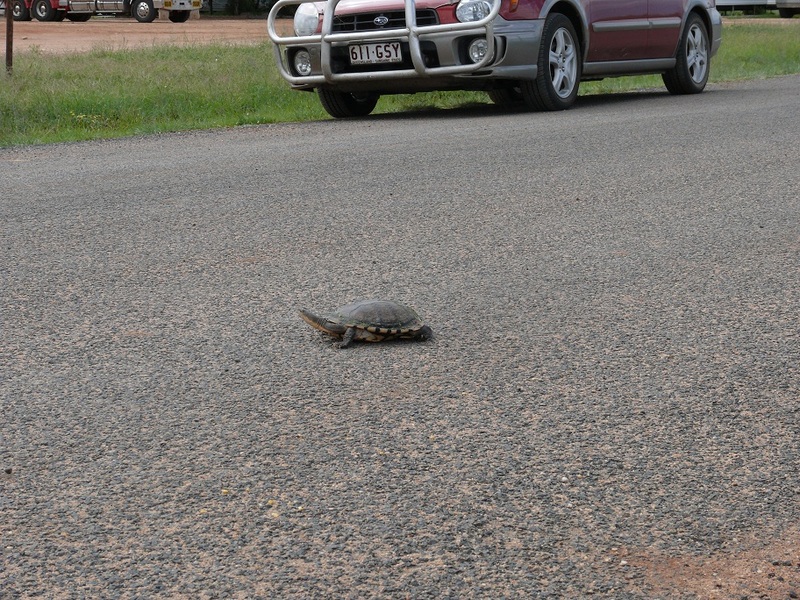 On the way home I swerved to avoid a large brown snake but I could not see it in the rear view mirror. Hmmm. Donnis stayed home and did craft work. After lunch I fell asleep. Donnis went for a swim. We made a pizza for dinner. The river here is like a super highway where all manner of birds swim and fly along and across it. 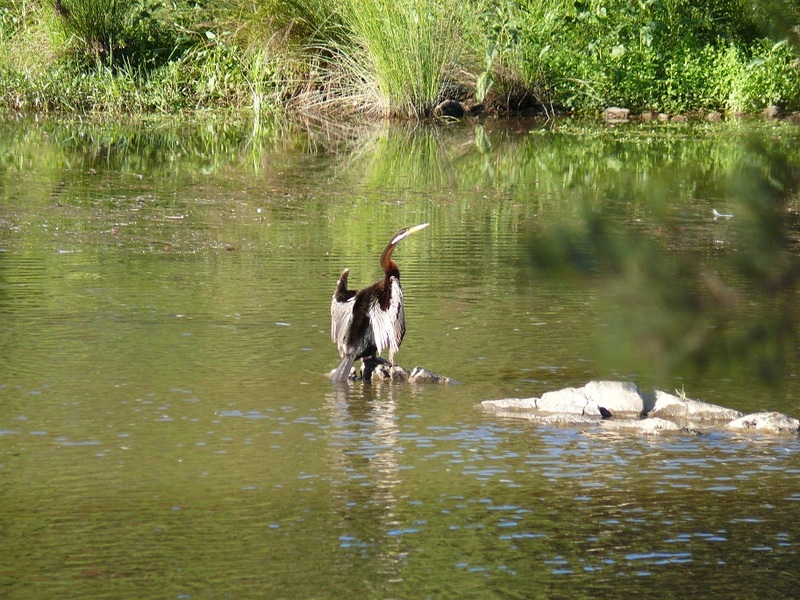 A Darter, one of many birds using the Gwydir as a highway. This evening just as we were taking the pizza outside to eat a parent duck and 7 ducklings swam passed. This is such a lovely spot but we have to move tomorrow. I am getting cold feet about trading the car but Donnis will feel more comfortable so we are going for it. Look forward to next weeks post when the deed will or will not be done.